Cricut invited me to create a trendy t-shirt and I had so much fun brainstorming and crafting this beauty. When I saw the options in the new Trendy T-shirt Cartridge, I got so excited. There were so many fun images just waiting to be used. 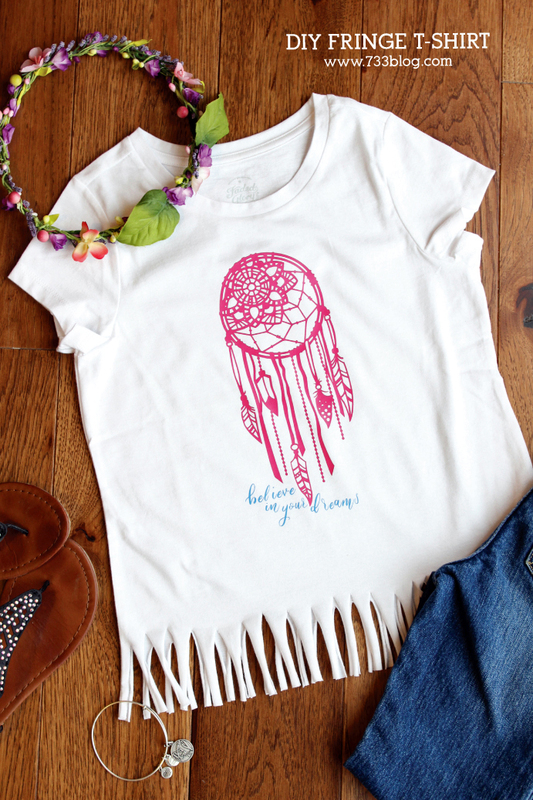 I went back and forth between the elephant and the dream catcher since my daughter loves both and I knew I just HAD to turn one of them into a shirt for her. Obviously, as you can tell by the title, I decided on the Dream Catcher. 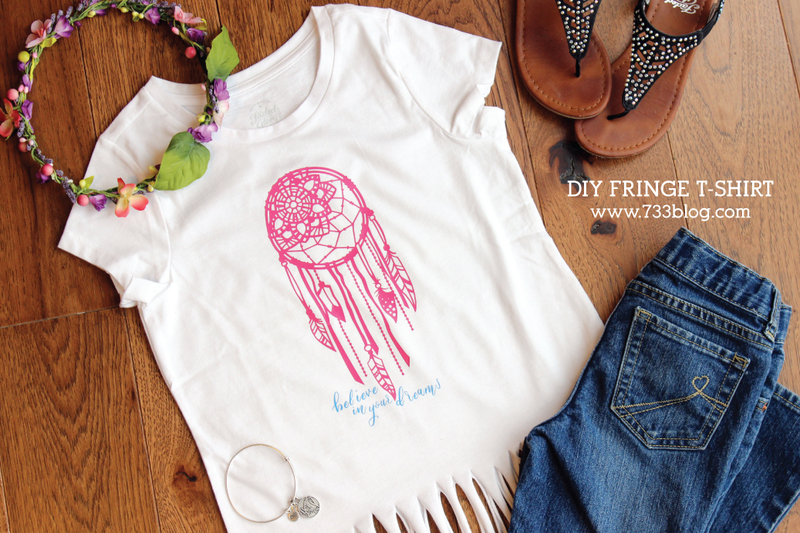 Follow along and I’ll show you how I made this dreamy DIY Fringe T-Shirt. This post does contain affiliate links for your convenience. 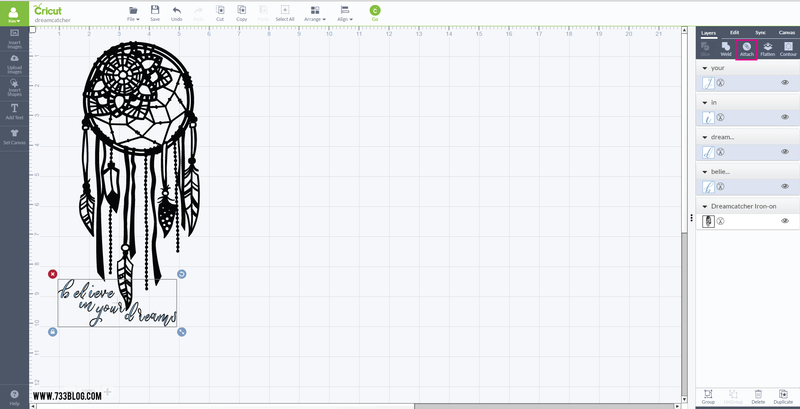 Choose the image that you want to use and add it to your design mat in Cricut Design Space or click the link to my Dream Catcher Design file in the supply list. Size it to fit your shirt – making sure to leave several inches at the bottom of the shirt, because we’ll be adding in some fun fringe later. Add text if desired – I used the fabulous Cricut font called Pen & Ink. If you want both your dream catcher and words to be the same color, make sure they are the same color in Design Space. If you want them to be different colors, make sure to change them so that the machine knows to cut each piece from different vinyl. If your words are separate images, make sure to select them all and click “attach” to keep them in the correct format. Send the design to cut, making sure to select “Mirror Image for Iron-On”. 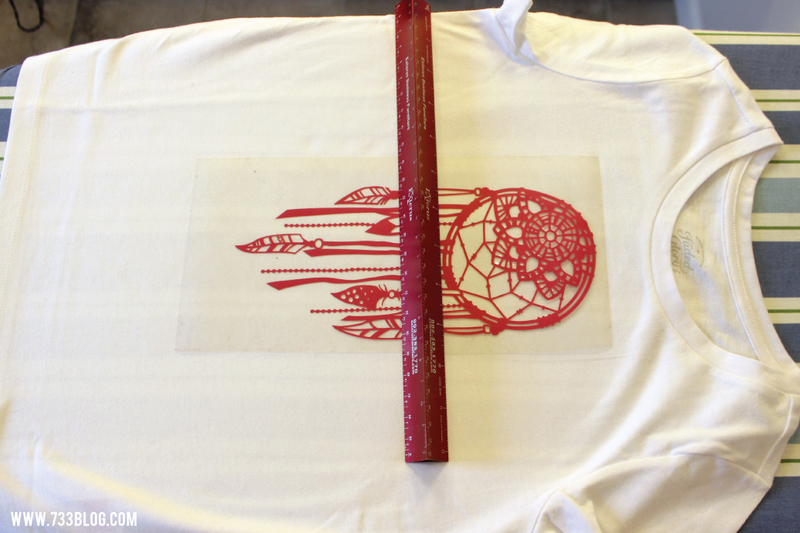 Load your heat transfer vinyl onto the mat and into the machine. Once the design is cut, it’s time to weed… and weed… and weed. This dream catcher isn’t for the faint of heart, but it is totally worth it! Once you’re weeding is complete, go ahead and follow the directions on the heat transfer vinyl to adhere it to your shirt. 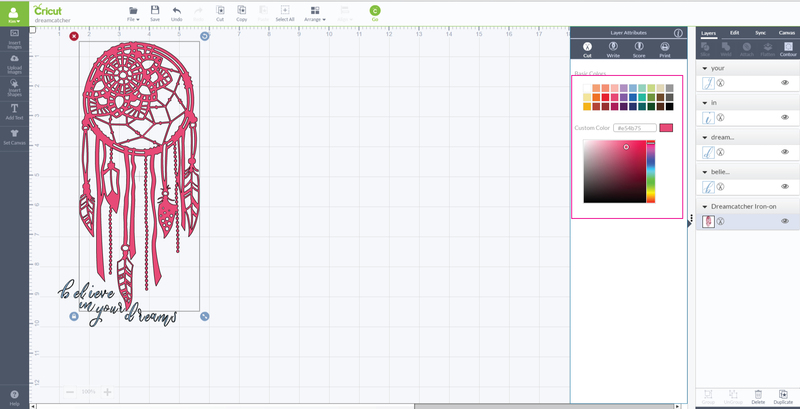 I use a ruler to ensure my design is centered. I usually set my iron to high cotton, no mist and use a thin piece of fabric as a barrier. Once I’m done the front side, I turn the shirt over and iron the back as well, just to make sure the vinyl is really stuck in place. That’s it! Your shirt is ready to be worn out on the town. This is so amazing the detail this Cricut creates with this gorgeous design! How fun! I love that dreamcatcher! I can imagine it on a big ol’ bag to carry to the beach in the summer. So cute! Love the fringe… my girls would LOVE that shirt! I love this shirt! Such 70s vibe with the dreamcatcher and fringe – so fun! Thanks and Yes! That was my intent! Whoo hoo to that coming across. 😉 Fun little retro shirt that is totally in style today. That is so fun!!! 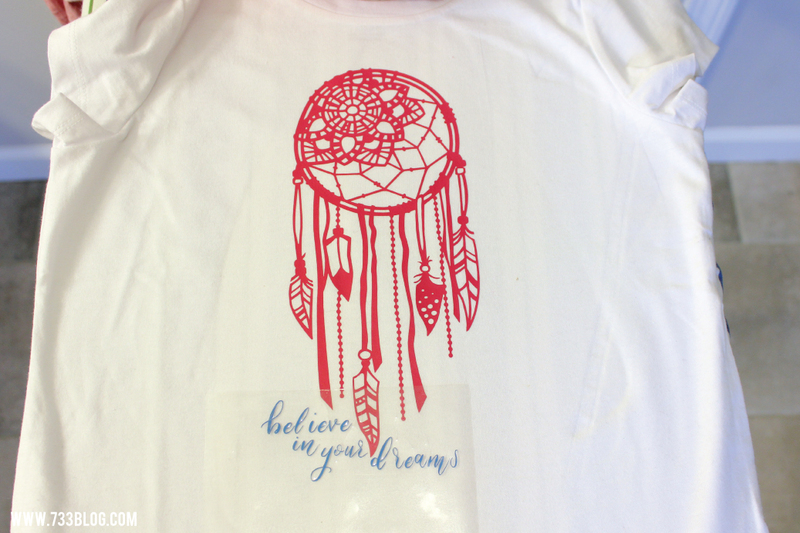 Love the dream catcher iron you created — smart for summer!